Considered to be one of the most hyper-luxury developments within the blue chip suburb of Kew, The Grounds is set to wow buyers with features never before seen in the Australian property space. 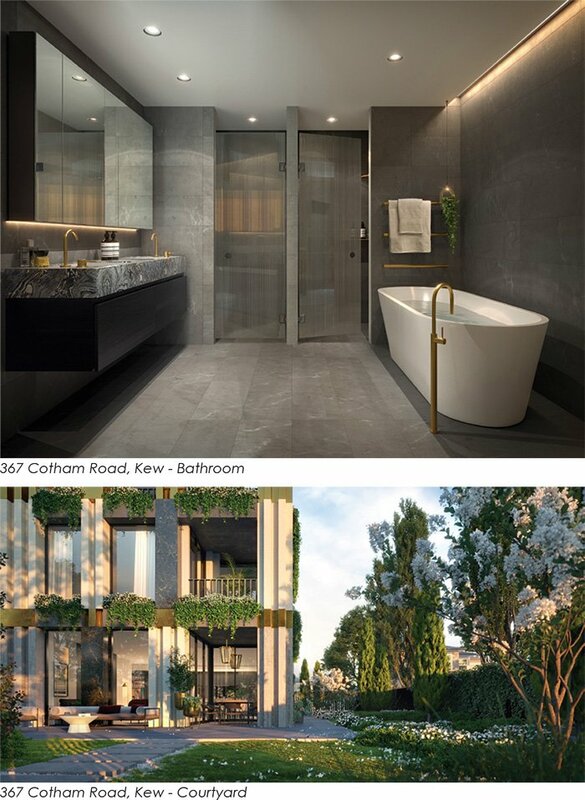 Featuring 20 luxurious apartments in collaboration with architect Fender Katsalidis and landscaper Paul Bangay, the 2,000 square meter site will boast a range of two, three and four-bedroom house-size apartments with prices starting from $1.415 million. The residences are targeted at local downsizers and owner-occupiers who are looking to stay within the suburb they know and love, but without the upkeep of a regular sized home. Located amongst the exclusive Sackville Ward community, Beulah International is set to deliver the first project of its kind within the surrounding area. The Grounds of Kew sets a new rhythm for design, offering residences that are grand in scale and indulgent in lifestyle. The individual residences celebrate artistry and craftsmanship amongst the rich heritage and natural assets of Kew. Drawing inspiration from Sackville Ward’s grand mansions and Federation Architecture, The Grounds will only be four levels high. Set back from the public domain, the entrance to The Grounds is framed by a bronzed gateway and two contemporary columns, leading to a canopied doorway. Residents will have the option of two customised material and colour palettes, with the lighter scheme featuring light stone and pale joinery with accents of bronze, whereas the darker and more dramatic scheme brings together graphic stone, rich joinery with the bronze highlights. Beulah International Executive Director Adelene Teh said the vision of this project is to deliver one of the most prestigious addresses in Melbourne. “Kew is one of the most prestigious addresses in Melbourne and is an untapped market when it comes to hyper-luxury, modern developments,” she said. “Few in Melbourne are currently building in these key areas for the generation looking to retire in something that is the pinnacle of design and incredibly spacious with massive kitchens and butler's pantries, wine cellars, walk- in-robes and plenty of storage; as we acknowledge that these are still key important elements to the residents. Adelene said residents can expect lots of stone and heavy materials, reminiscent of the grand mansions in the area. “From every touch point, there is personalisation and high quality materials used. “Residential design is FKA’s bread and butter, they have an amazing understanding of how individuals like to live and always ensure the spaces are designed efficiently and responds to the residents' needs,” she said. 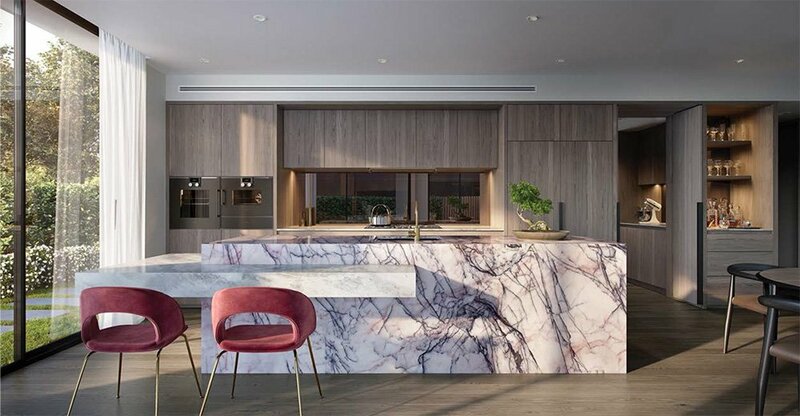 Each kitchen will feature a marble or granite kitchen island, complemented by a cantilevered breakfast bar, Gaggenau appliances and a butler’s pantry. Bedrooms feature floor to ceiling windows, with each master bedroom boasting a his-and-her walk-in- robe, complete with a marble-top dressing table, full length mirrored panelling, internal drawer division and open shelving. Award-winning landscaper Paul Bangay has drawn inspiration from the grand estates and gardens of Kew to create a private playground for each ground floor residence, with courtyards ranging in size from 200sqm – 300sqm. With Beulah driving innovation in the Australian property space, The Grounds of Kew will boast Australia’s first ever private putting green within an apartment project. This is a rare and fantastic opportunity for residents as they are able to practice their putting skills before playing down at the local Kew Golf Club; one of Melbourne’s oldest established golf clubs, home to over 1,300 members. As part of the initiative, Beulah has partnered with Australian professional golfer and PGA member Craig Spence, who provided guidance on how to achieve the best possible private putting green experience. Spence held a private putting green masterclass at the display suite in June this year, sharing that the opportunity to have your very own putting green for personal practice, inside the boundaries of your own home is a “dream opportunity”. So much so, that even Tour Professionals in the US are putting in private putting greens. atop The Grounds, accessed by a private lift. onsite display suite at 367 Cotham Road, Kew.